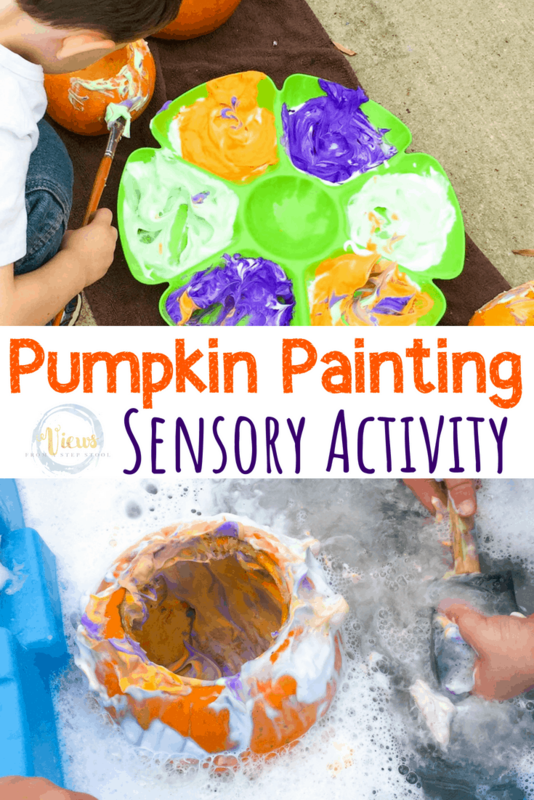 This Fall pumpkin activity for toddlers is the perfect way to engage in sensory play with one year olds and older children alike. 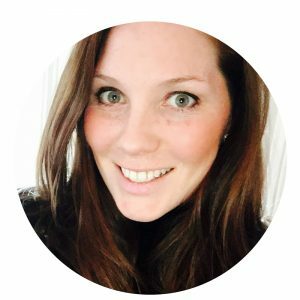 Rinse and repeat! 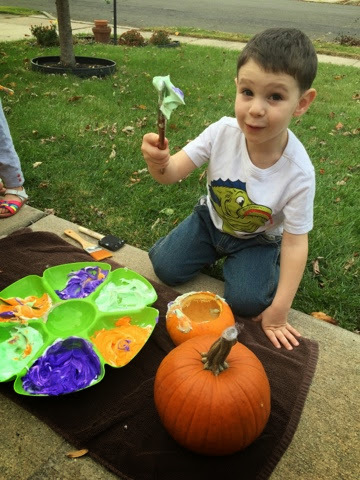 Do your kids like to paint pumpkins? 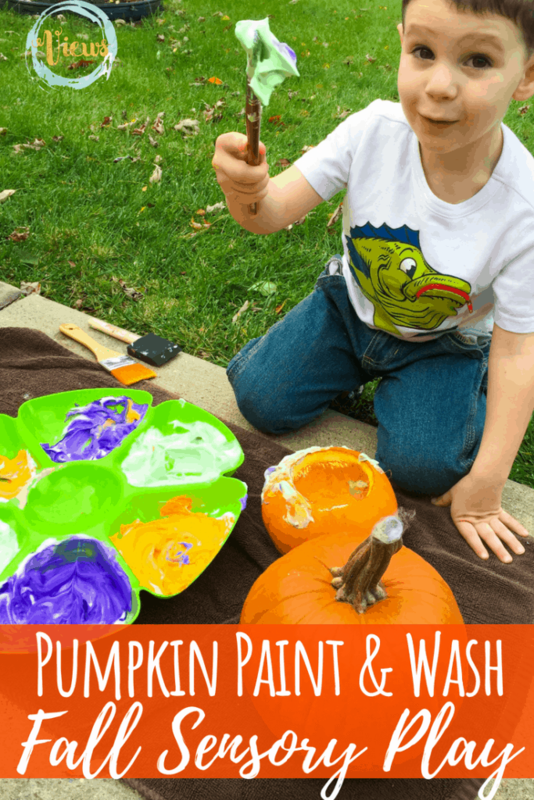 Turn it into a fun pumpkin washing activity by having the kids paint, and then wash their pumpkins, only to do it all over again! 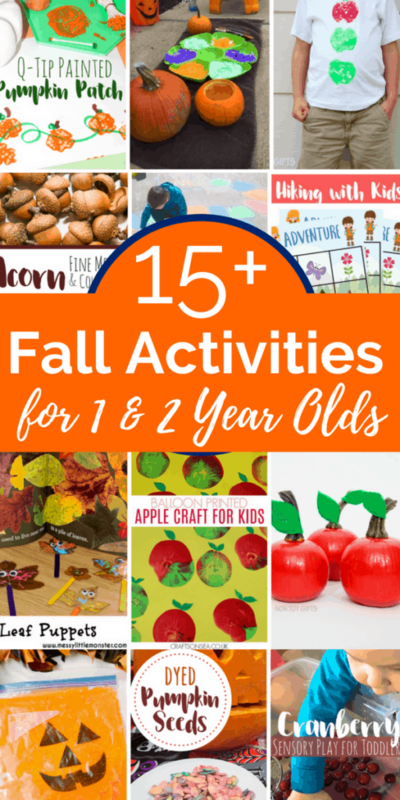 This makes a really fun Fall pumpkin activity for toddlers. 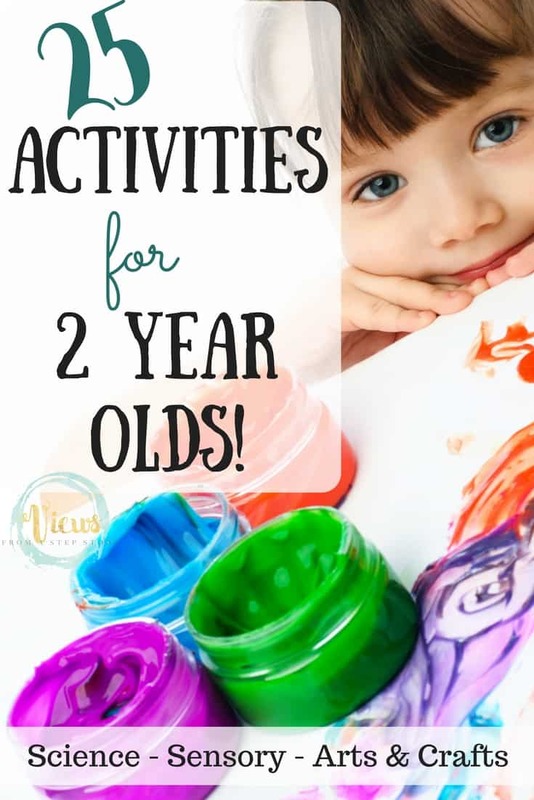 What a great sensory activity for toddlers and older kids alike! 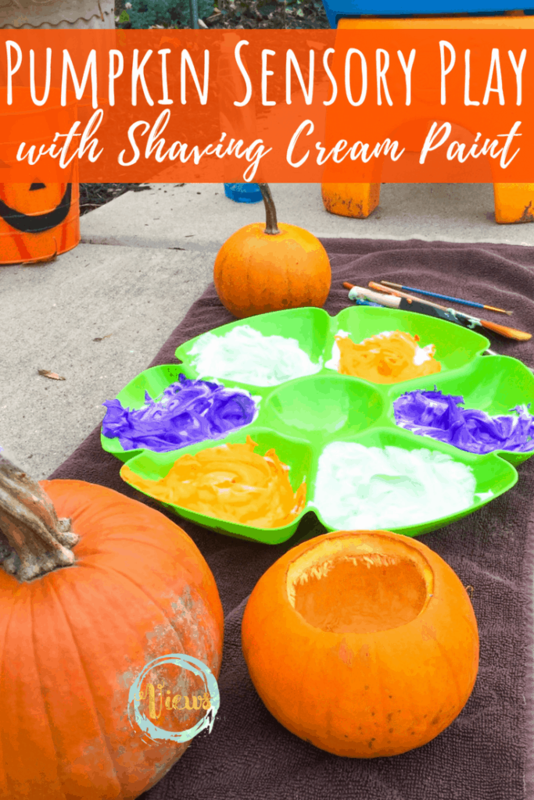 This activity sparks creativity and encourages sensory play through one of my favorites, shaving cream paint! 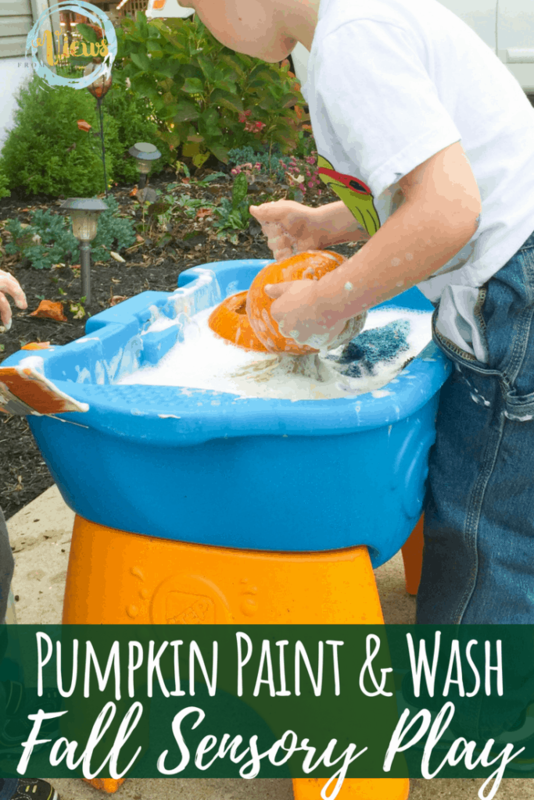 To make, just add a bit of food coloring to shaving cream. As a quick tip, I prefer Barbasol-type shaving cream to the gel as it makes for a puffier paint. 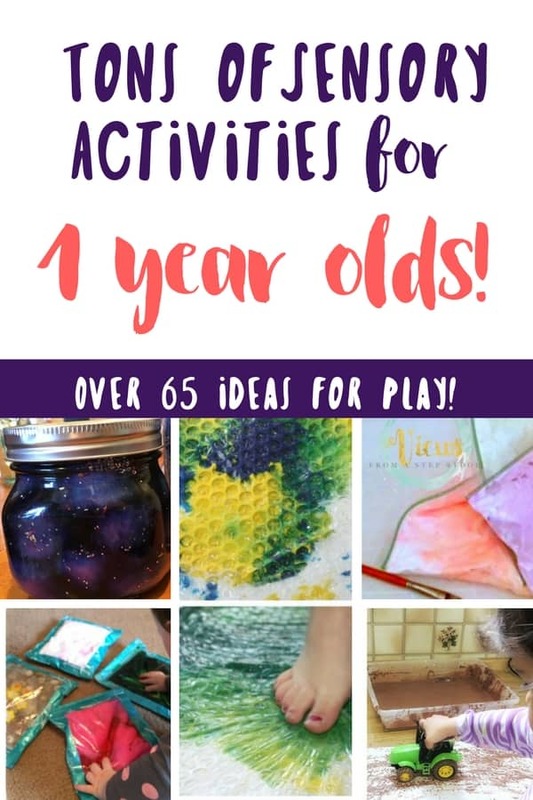 You can usually find a generic form of this at the Dollar Store which makes for a pretty inexpensive project. 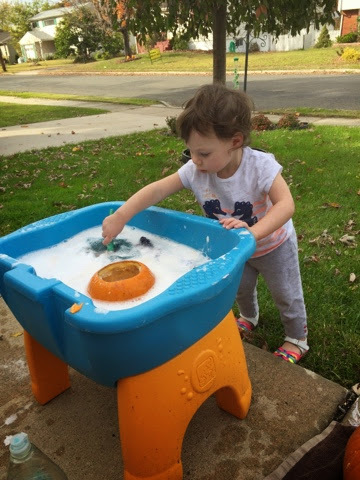 We usually use this paint in the bathtub but I thought it would work well with the washing component of our play, which it did! 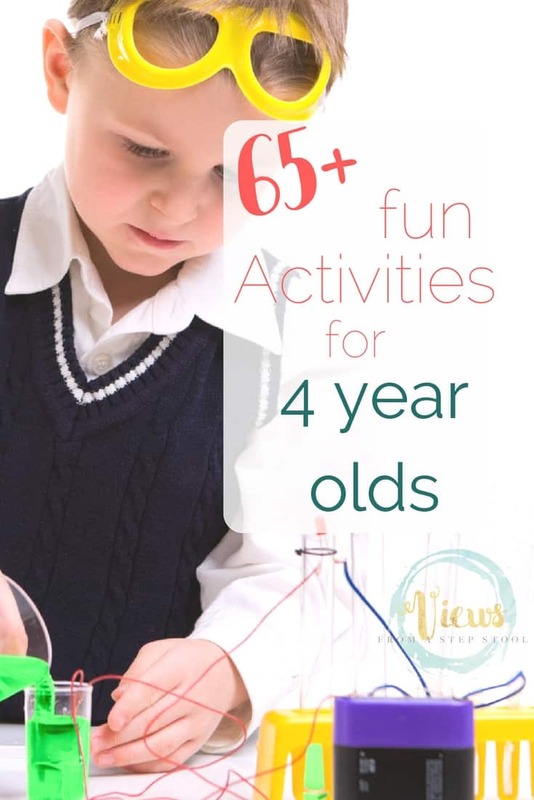 An invitation to create encourages the children to play in an open-ended fashion without any real instruction or ‘right or wrong’ way of completing a task. 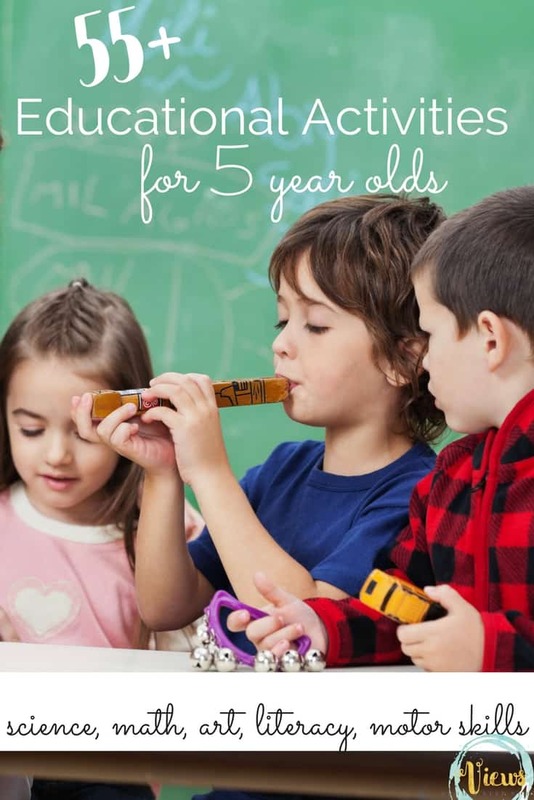 Check out this ‘how to’ for them by The Imagination Tree. 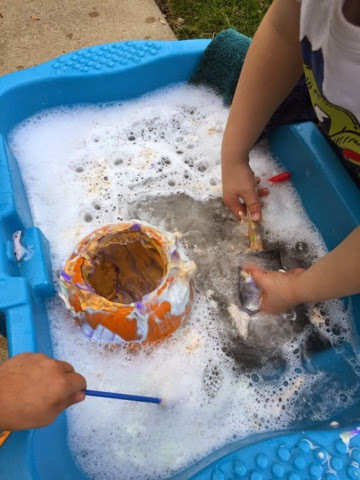 By setting out the materials in an inviting way and then letting the child explore them however they choose, you will see some great creativity and thought emerge. 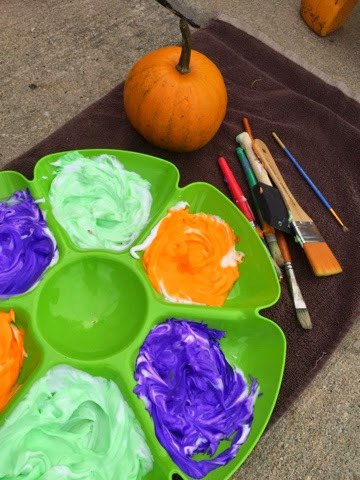 I set out the paint, various types of brushes, pumpkins (hollowed and whole) and a bin of warm soapy water and washcloths. 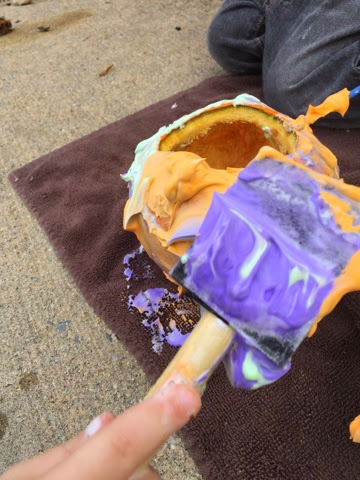 Naturally, the kids gravitated to the paint first, my oldest took to the hollowed out pumpkin so that he could feel the difference in painting the outside vs. the inside of the pumpkin. 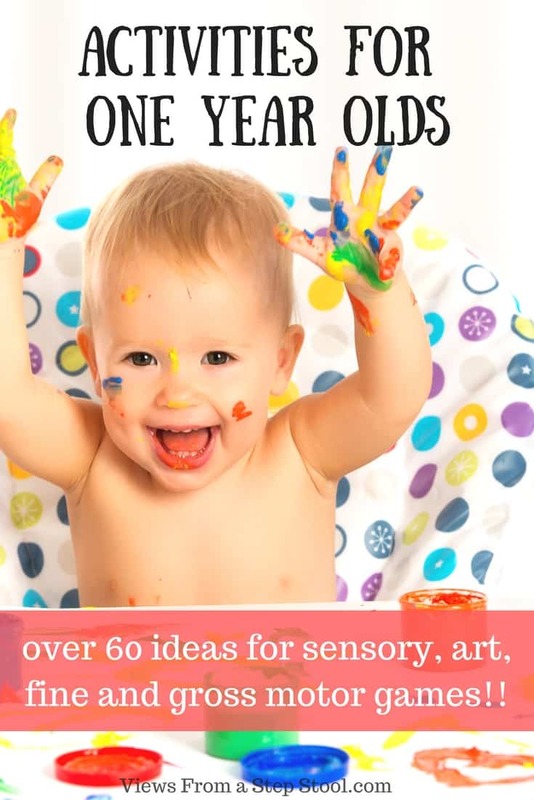 My one year old loves to paint but usually likes to make a pretty big mess with her paint. 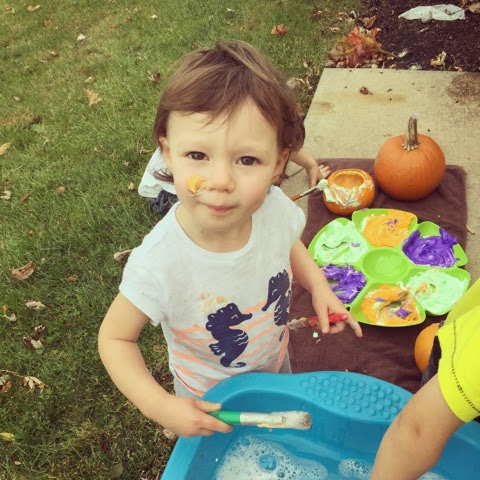 So gross motor, outdoor painting is a great combination for her. 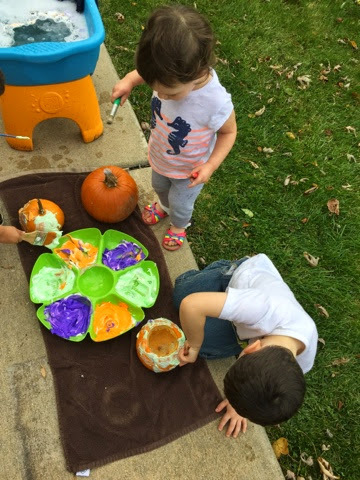 They alternated between rinsing paintbrushes, painting pumpkins, rinsing pumpkins, and painting the ground. 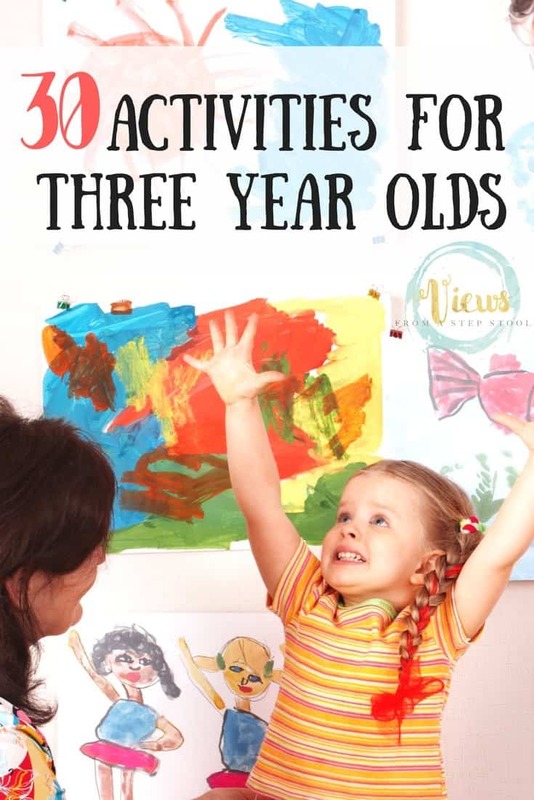 It kept them occupied for quite some time and was easy to clean up- can’t beat that! 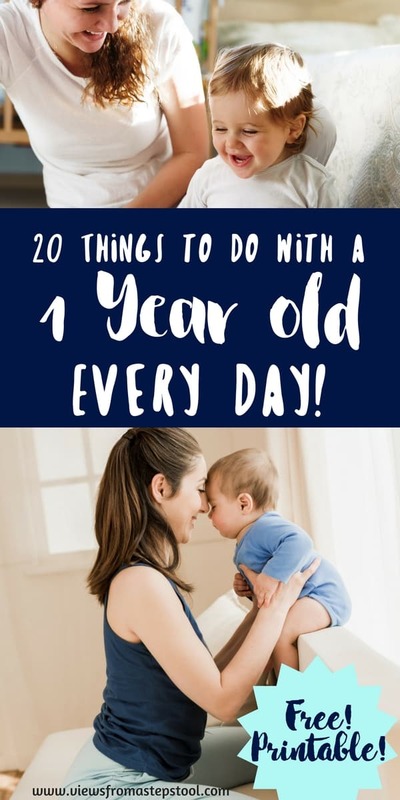 *This post was originally published on October 29, 2014.